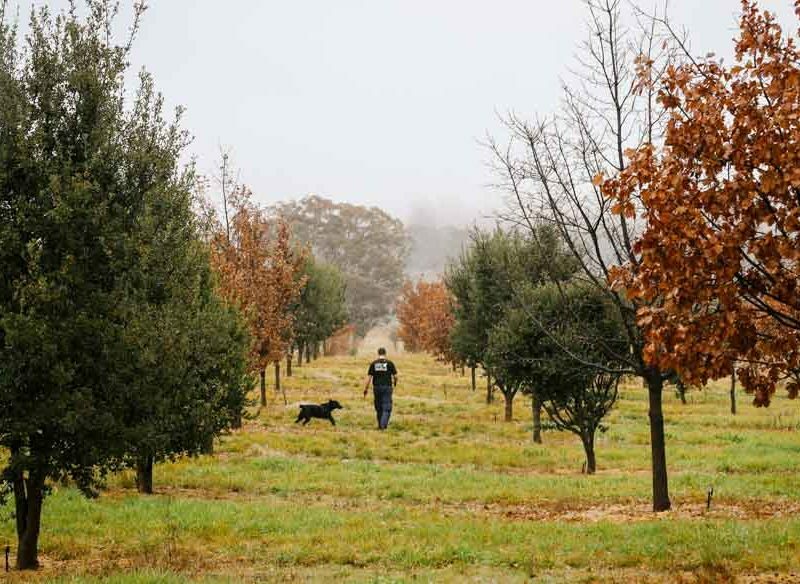 Go on a truffle hunt with truffle dogs Nala, Samson, Willow, Simba, Bear and Max and return to the farm for a deluxe truffle tasting (photo: Lean Timms). 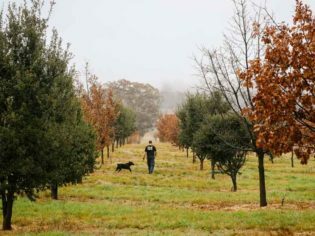 Visit a gin distillery inspired by Tasmania’s wild rivers and truffle-hunt with dogs called Simba and Nala. But not until you’ve sampled Adelaide’s thriving bar scene and swung by Kitchen by Mike’s new airport outpost: wining and dining in Australia this year is as dynamic as ever. Adelaide used to be the place where cool bars went to die. But no longer, because some of Australia’s best bars are now in the South Australian capital – you just have to know where to find them. Cute and intimate bar Maybe Mae will serve you great cocktails and great vibes all round. We love cute-as-a-button bar Maybe Mae (15 Peel Street, Adelaide) for gorgeous cocktails and a Mad Men-in-Copenhagen interior. Pink Moon Saloon is a lesson in refinement, with its steeply angled roof and walls squeezed into a laneway’s width, like Tokyo’s Shinjuku Golden Gai redefined for southern climes. Stop in for a Rhubarb Iced Tea cocktail and consider yourself the embodiment of chic. Check out Adelaide’s ever growing bar scene, and grab a nice wine at Mother Vine. Maybe a wine is what you’re after, though? No problem – head to Mother Vine for a huge variety of wines by the glass that are as lovingly selected as they are delicious. Sydney-born David Thompson was the first chef to be awarded a Michelin star for Thai cuisine at his London restaurant Nahm, and over the past year-and-a-half he has opened three restaurants in his home country: Long Chim in Perth, Sydney and Melbourne. Long Chim restaurant is open in Perth, Sydney and Melbourne (photo: Nikki To). Here, he shares his favourite dishes to enjoy on the menu now, and to look forward to in the future. Grilled Pork: Simple and smoky and fragrant, marinated in soy and garlic and grilled over charcoal and coconut. Guay jap: Rolled Noodle Soup with five-Spice and Braised Pork. A rich and comforting dish. Sen gati: coconut rice noodles with prawn, pork and yellow beans. The coconut noodles are nutty, sweet and riddled with prawns, pork and bean sprouts. Plaa dtat dtiaw: sun-dried trevally with green mango. The semi-dried fish with fish sauce is deep fried and covered with green mango, chillies, mint and lime. Rin’s thai tea ice-cream: The tea ice-cream is made with Thai tea and condensed milk – nothing more needs to be said about it, other than that it’s a compulsory dish with which to finish the meal. The best dish on the $185 dego at Sydney’s Momofuku Seiōbo is also available at the bar… for $8. It’s called ‘busted’ roti. Busted roti with onion dip and muntries from Momofuku. It’s based on the Trinidadian dish ‘buss-up shut’ (‘busted-up shirt’): a heaving mess of butter-drenched, crisp and soft, blistered and melting, stretchy paratha. Order this and a glass of skin contact wine and enjoy a world-class dinner for under $30. What are you drinking if you’re not drinking gin? It’s the hottest spirit of the moment and there are some excellent choices out there, many of which are coming out of Australian distilleries. Drink more gin at Southern Wild Distillery in Devonport, Tasmania (photo: Jason Loucas). Southern Wild Distillery in Tasmania has released a range of three gins inspired by local rivers Dasher and Fisher. They’re called Mountain, Meadow and Ocean and each tell a story about the spectacular landscape surrounding the distillery. Kitchen by Mike has opened its doors at Sydney Airport, within the T1 international terminal. Kitchen by Mike has opened in T1 International Airport in Sydney. You can Check out Mike McEnearney’s healthy-eating, canteen-style fare by ‘dining in’, or picking up one of his customisable ‘Fly By Mike’ tray-packs to eat on the plane. Longsong is opening above Longrain in Melbourne this winter. Hospitality royalty John and Lisa van Haandel are behind the project, and they’ve brought along David Moyle of Hobart’s celebrated Franklin restaurant to run the food. With a Thai-style grill and Australian-focused drinks list – most of which will be served out of kegs or barrels – this is set to be the place to be as the temperatures plummet. Yellow in Sydney’s Potts Point has long been lauded for its vegetarian options. But last year, head chef and co-owner Brent Savage relaunched the restaurant’s dinner menu as 100 per cent vegetarian. Press Curd, Charred Leek and Black Garlic dish from Yellow in Sydney. Try dynamic dishes from its tasting menu – like curd, charred leek and black garlic – and you’ll see that vegetables can be just as delicious as any meat dish. Find out what natural wine is all about at Harkham Winery in the Hunter Valley. Spend the day sampling the wines at the cellar door (don’t miss the seriously interesting shiraz and zesty semillon) then (if it’s a weekend) pop into the pop-up restaurant next door for a laid-back dinner of Latino-style street food as the sun sets, before heading off to bed at the on-site accommodation. You know all those artisan sweet treats that pepper your Instagram feed and fire up your appetite? Like Andy Bowdy’s crazy cake creations, Shortstop’s doughnuts and Butterbing’s gluten-free cookie sandwiches? Well at Flour Market they’re all in one place.The festivals take place throughout the year in Sydney and Melbourne. Check out their Facebook page to keep up to date. It turns out that truffles grow extraordinarily well in Canberra. The Truffle Farm opened in 2016 and it’s so much more than a rustic homestead. Go on a truffle hunt with truffle dogs Nala, Samson, Willow, Simba, Bear and Max and return to the farm for a deluxe truffle tasting. Or go even more luxe after your hunt by heading to the warmth of the truffle shed for a six-course degustation prepared by ex-Emirates Wolgan Valley Resort & Spa executive chef Damian Brabender.